Hello all. I don’t have a specific topic today, so I thought I’d just let everyone know what I’ve been up to lately. I’ll make it short and sweet. 1. 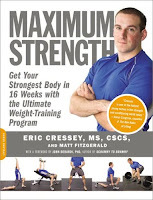 I am in the middle of week 11 of the 16 week Maximum Strength program. It’s been going well. A few weeks ago I benched 265 which is an increase for me of 10 lbs. That is the only exercise where I have maxed out since checking my maxes at the beginning of the program, but I have certain indications on some other exercises. In the first phase I was rack pulling 385 lbs. for reps. In this phase I am pulling 435 lbs. That feels good. I hope that kind of increase transfers to my full deadlift. This week I front box squatted 285 (I think). I don’t know how that transfers to my back box squat but we’ll see. Overall, it’s going well. I am looking forward to seeing where I end up. After this I might go into a fat loss mode but I’m not sure yet. I could go the other way and really try to go for hypertrophy. After doing very low reps for a while, I might be primed to see some good results in the 10-12 rep range. We’ll see. 2. 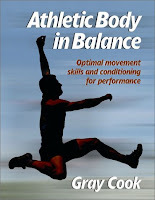 I started reading Gray Cook’s Athletic Body in Balance book. Outstanding. He basically writes about how our basic movement patterns need to be correct and solid before we can really move on and get the most out of our training and our athletic endeavours. When you hear him talk, it really becomes apparant that he is one of those people who really shapes the way others think and do things. 3. I am getting ready for the start of Fitness Fridays. We begin next Friday, April 3rd. I am very excited about it and I can’t wait to begin. If you don’t know what Fitness Fridays are , my friend, Massage Therapist Sarah Marie Sonoda (see her website here http://massagebysarahmarie.com/) and I are getting together for a unique one hour package. It will feature a half hour training session with me and a half hour massage with her for only $60. If you pay in advance you will get an additional $10 discount and it will be only $50. We are doing this at Medina’s Gym which is at 2365 B Street in Hayward. It will feature a free consultation with me where we will go over your goals, etc. I will make up a customized plan for you and then we will start. If you are interested, please call Sarah at 510-432-2311. You could also call me at 510-754-7113 or email me at mitchrothbardttraining@yahoo.com. (The official procedure is that Sarah will be handling the sign-ups, but I assume if you are reading this then you know me at least a little bit.) We will sign you up and schedule a time when we could meet for our consultation. As I said before I am really excited about this. Well, that’s really about it for the moment. Just a quick one today. As always, email me at mitchrothbardttraining@yahoo.com or leave a comment if you have any questions or comments. If you are interested in Fitness Fridays, please let me know soon. Spots are filling up. I leave you with Scot Mendelson benching 715 lbs. A nice highlight is him getting the s@#* slapped out of him before the lift. Awesome. A few weeks ago, my friend Ross asked me if I would write up a program designed to help him with surfing. This is actually pretty interesting for a few reasons. You see, there is bit of controversy in the fitness world about training on what are called “unstable surfaces”. 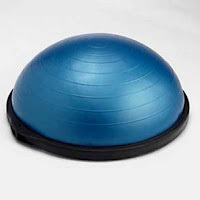 Unstable surfaces are the things you see at the gym like the Bosu Balls and stability balls. A few years ago doing exercises while standing on these types of things was all the rage. It was considered “functional” training. It was thought to activate the core and increase balance. What we know about this now (Eric Cressey has written extensively about this http://ericcressey.com/unstablesurfacetraininghtml) is that it really doesn’t do anything. In fact it may actually hinder athletic development to train like this due to the fact that your force production is extremely compromised. In other words, you simply can’t move much weight while standing on one of these things. The current thinking really makes sense when you think about it. When do you have to adjust, with both feet, to the actual surface you are standing on? When a running back makes a cut, for example, they certainly need dynamic balance because they are moving, but they are not just standing still. It just has no carryover. The only sport I could think of where this might not be the case was surfing. Hello. I have a client who is a surfer and wants me to write a program for him. I know generally what I want to do. Standing compound exercises, thoracic mobility, emphasis on core, etc. My question is, would this sport be one where using those silly bosu balls and other unstable surfaces might make sense? The argument against is usually that the client is not performing on an unstable surface while playing football, basketball, etc. but in this case they are. Any thoughts? Are you a fellow surfer? I would include rotary exercises. Just because you have to balance on a surf board does not mean you should do balance training. Most surfers do not have that issue, that is if they already know how to surf. Beginners are different. Surfers will need more explosive type movements, hip and ankle mobility and again rotary type exercises. Surfers’ main concern is paddling and catching the wave, having the ability to explode up from a prone position and stick the feet position. Next it is about having the ability to make abrupt turns as snapping off the lip of a wave and if they are lucky enough to catch a long ride have the muscular endurance to finish the wave. Hope that helps. I have worked with top professional and recreational surfers in San Diego. That was very interesting to me and something that I hadn’t thought of. As far as training, though, it certainly makes sense. Think of it this way: We know that the best way to master a certain skill is to practice that specific skill. That’s called the “Specificity Principle.” To apply that to this, if you are at the point in your surfing ability that you can’t perform the basic task of effectively balancing on the surfboard, you should be surfing to work on that. It is a task that is intrinsic to that activity. To use another sport as an example, you wouldn’t try to think of another excersise to help you learn to catch a baseball, you would just play catch. The gym is to help with more general traits that can be improved, such as strength and conditioning. In other words, a good training program can help you balance more effectively or catch a baseball better, but it can’t help you if you don’t know how to do those tasks to begin with. Ross had also mentioned to me that he was having some shoulder issues due to sitting at a computer desk typing all day. If you have read about these kinds of issues much you know that if he has some shoulder issues from sitting all day, odds are he also has some hip flexor tightness and therefore some postural issues in his hips and therefore his low back. What this meant as far as writing the program was that I needed to focus on a few things. For the surfing aspect: explosive exercises, shoulder conditioning, rotary exercises, core strength and stability. For the postural stuff, thoracic mobility, hip mobility, scapular stability. Really, to a large extent I was looking at hips and shoulders. Sound familiar? I asked Ross how many days a week and how long he could spend in the gym and I also asked him if he had any other injuries. He gave me those answers and I went to work. I decided to divide everything into a four-day push-pull split. That way even if he only went three days a week he could still just keep going through Day 1, 2, 3, 4. I knew that I wanted each day to have a core rotation and stability exercise and I also knew that I wanted hips and glutes to get worked in some fashion each day. I came up with a plan that also included lat-pulldowns and some overhead pressing until I thought that if Ross had some shoulder issues, he might also have a shoulder impingment which would give him some pain when lifting his arms overhead. It turns that this was the case so I decided to take out all of the overhead moves and replace them with different rowing variations. It meant that the pushing days would have a pulling exercise, but they would all be different variations. I used seated rows, standing rows, face pulls, and inverted rows. What this will hopefully accomplish is strengthening the muscles in the trapezius and the serratus areas as well as others, to help bring the scapula back to optimal position. It will help counteract the fact that the shoulders are in front of him all day in internal rotation. Some additional aspects of the program are only a 60 second rest between sets, (for conditioning purposes), as well as a Mobility Circuit for a warm-up and some cardio work at the end which alternated between 10 minutes of intervals at a 20 second work/40 second rest protocol on one day and 20 minutes of steady state cardio at his target heart rate the next. The mobility circuit is a series of stretches/movements that help develop range of motion and mobility in the major joints in our bodies. Mainly hips and shoulders. It is something that sometimes gets neglected, although it should be a very important part of every training session. For Ross I made sure that it had a good helping of shoulder work. Basically the circuit functions as a warmup although I don’t like to refer to it as that. In most people’s minds a warmup is something that gets rushed through so the “real” work can begin. The reality, however, is that for many people this circuit is more important than the “main” workout. At least at first. For Ross, as with many people, the purpose of it is really to get the hips and shoulders mobile in the proper way again. To get the hips and shoulders out of the flexed position that they are continually in. I programmed the cardio work alternating an interval day with a steady state day mainly because doing intervals more than twice a week is very tough at first. Another thing to realize is that this program is really only for one month of training, assuming he does four workouts a week. I have ideas about how I would like to build upon what we have, but I won’t know specifically how that will go until I get feedback from Ross on how the program is working. There is a very good chance that things will need to be adjusted before the full cycle is complete. Like many things, you just don’t really know how something may or may not work until it is tried. The program will change as he adapts to it and as his goals and condition change. D1 Plank 3 sets of 30 sec. E1 Side Bridge 3 sets of 30 sec. C2 Plank 3 sets of 30 sec. The letters beside the exercise (A1, B1) represent the order of exercises. When you see A1, A2 that means you do one set of the A1 exercise and then one set of the A2 exercise then back to A1 etc. Well, that’s about it. I hope I was able to get across the steps I went through to design this program. It is really the kind of detail and work that I intend to put into each program I write. People are different. Their goals, their bodies, their needs. You can’t just write one program for everybody. There are certainly principles that are universal, but how you apply them is different for everyone. Please let me know if you have any comments or questions at all. You can leave comments in the comments section here or email me at mitchrothbardttraining@yahoo.com. I promise to answer you back. I would really love to be able to do a mailbag post, but I need questions for it. I am very happy to announce that Friday, April 3rd will mark the start of Fitness Fridays! My friend, Massage Therapist Sarah Marie Sonoda (see her website here http://massagebysarahmarie.com/) and I are getting together for a unique one hour package. It will feature a half hour training session with me and a half hour massage with her for only $60. If you pay in advance you will get an additional $10 discount and it will be only $50. 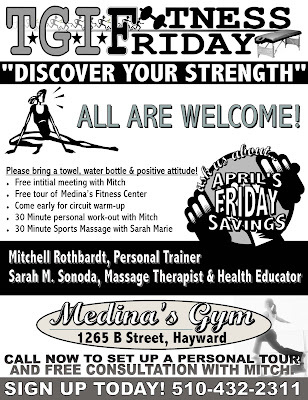 We are doing this at Medina’s Gym which is at 2365 B Street in Hayward. It will feature a free consultation with me where we will go over your goals, etc. I will make up a customized plan for you and then we will start. If you are interested, please call Sarah at 510-432-2311. You could also call me at 510-754-7113 or email me at mitchrothbardttraining@yahoo.com. (The official procedure is that Sarah will be handling the sign-ups, but I assume if you are reading this then you know me at least a little bit.) We will sign you up and schedule a time when we could meet for our consultation. We will be doing this at Medina’s Gym at 1265 B Street in Hayward. It’s a great location. We are really looking forward to getting started and we hope to fill up April’s schedule pretty quickly. It’s really a great deal. I am really looking forward to meeting and creating programs for everyone. I will be incorporating a lot of fun things into my sessions, from timed sets to punching intervals to straight sets. Resistance bands, bodyweight, dumbbells. It’s really going to be great. After our session, you will go to Sarah for a 30 minute massage. One thing that we are realizing now is how important soft-tissue work is to overall health. When our muscles get knotted up it can really effect how we feel and move, and many times things happen so gradually that we barely notice it. It’s only when the knots are rubbed out of our backs and shoulders we realize how tight we were, and many people don’t realize how much tightness in the upper back and shoulders can effect our low backs. Anyway, I really hope that you out there can join us for what should really be a lot of fun. I will give you any updates as they occur. Also, a couple of weeks ago, my friend Ross asked me to write up a program for him that focused on surfing. Check back tomorrow if you are interested in the process of how I wrote the initial program and the developments that went into the final one. I think this might give you an idea of the level of thought and commitment that will go into all of the programs I write and sessions that I do. Hello again. I hope you are all well. A few quick notes for today. I had some formatting issues with my blog for a little while and as a result I had to republish the last post. In the process of doing that, some of the formatting got messed up in the post. I tried to fix it, but not being an HTML programmer I don’t know how to. It’s mainly at the beginning of the post, and it’s only formatting, not content, but having a little visual issue there is better than having an issue with the whole blog. Anyway, I wanted to mention that. My training has really been going well. I am now in the ninth week of the 16 week Maximum Strength program and I am feeling great. Certainly the best I have felt since the injury. I did a 265 lb. bench last week during a 1 rep max test which is an increase of 10 pounds. Pretty good for 8 weeks. This is the third stage of four. I’ll keep you updated. I don’t want to jinx anything, but I hope to have a big announcement coming up soon. Hopefully by the beginning of next week. Anyway, rack pulls tomorrow. Did you know that you could take a pill that could make you lose 25 pounds of fat in a week without diet or exercise? Did you know that you could take a pill that could increase your bench press 50 pounds in a day? Did you know that as long as I classify my product as a supplement I can say pretty much whatever I want about it and as long as it doesn’t kill people the FDA can’t do anything about it? It’s true. Pretty much anyone with a a knowledge of Photoshop can make a good looking ad and a good looking package, fill a capsule with something and sell it as “Fat-Buster 3000”, the fat-burning furnace pill! Below is a scene from the excellent movie Bigger, Stronger, Faster. In it the narrator literally picks up some guys from the street and starts making supplements. 1. If you take something and you notice a huge monumental, unbelievable, night-and-day difference right away, stop taking it! The body is not meant to work like that. Even the best supplements should only work in a slight, gradual fashion. The reason we have to fight and work so hard in the gym to change our health or physique is because the body is an incredibly efficient machine. Our body only works as hard as it has to. This allows it to hold onto fuel longer, which enables it to survive longer in the wilderness. This goes back to the very beginning of man’s existence. If you take something and it has a night-and-day kind of effect, it’s probably damaging you in some way that you don’t know about or it’s anabolic steroids. Just ask the people who took Fen-Phen about this. 2. A supplement is just what the name says it is: a supplement. That is, something in addition to your normal diet to help you a little bit. A supplement should not be the main focus of what you are doing. If it is, you are probably lacking in some area and you should figure out what it is. All that being said there are a few supplements that I take that I think help me. They may or may not help you, but I have done my research and my own personal trial and error and this is what I think. 1. Protein Powder. As active inviduals, we should aim to take in about 1 gram of protein per pound of bodyweight. This can be a little difficult if you are relying on whole foods to get all of it. For example, I weight about 182 lbs. I would need to take in almost two pounds of chicken a day to hit that. That’s certainly possible, but a little difficult. Protein powder allows you to ingest a quick 30 or 40 grams very easily, and carrying a little bottle of protein powder is easier than lugging around some chicken and a microwave. I still try to get most of my protein from whole foods, but the convenience of the powder is very helpful. 2. Fish Oil. Many nutrition experts don’t even consider this a supplement. They consider it an essential part of anyone’s diet. Fish oil helps with fat metabolism, brain function, heart health and joint health and probably a numebr of other things. 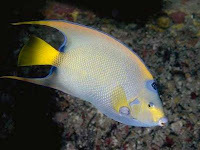 When was the last time you saw a fish with bad knees? 3. Creatine. Creatine is probably the most researched and talked about supplement ever. There has been some controversy, but it’s mostly been a bunch of hooey. The bottom line is, it works. Our muscles use a chemical called Adenosine Triphosphate (ATP) to contract when we are working at high intensity. The body runs out of ATP very quickly, usually within about 10 seconds or so. Creatine is the chemical that helps form ATP. We get some of it in various foods, but taking it as a supplement has been shown to help when working in explosive high-intensity, low-rep situations. In other words, if you are an endurance runner this won’t help much. If you are a sprinter it could be a boost. Creatine can help also help pull water into muscles which can help appearance a bit. The flip side of that, is that when you start on it, it gets rid of water everywhere else which means you do have to hit the can a bit for a few days. In short, use it if you are doing low-rep (6-8 reps and below) work. Much more than that and it probably doesn’t have that much of an effect. 4. Glutamine. About four or five years ago Glutamine was the big thing. A few studies came out that showed that it helped recovery and helped stave off catabolism. Since then, it appears that it has faded in popularity and reputation a bit. Some more recent studies have shown that it doesn’t really have much of an effect on recovery. I have taken Glutamine for quite a few years. Several months ago, after reading about a few of these newer studies, I decided that I’d see how I did off of it. I absolutely noticed a difference in my recovery. I had a lot more soreness and for a longer period. I got back on it and felt fine. A few months after that I again decided to drop it to see if the first time was just a bit of a fluke. I felt the same difference in my recovery. I got back on it and don’t plan on dropping it any time soon. Studies can say what they want, but I know how I feel and it works for me. Anyway, this is what works for me and what I have found. In the past I have also tried BCAA powder, HMB, Ultimate Orange, Hydroxycut, Ma Huang and probably a few other things I can’t remember. None of it really did anything for me. I have heard good things about BCAAs, but the recommended dosage is very high and very expensive. The amount I took didn’t really do anything. In short, supplements are really just an aid. Sure, they help, but in a minor way. The real work has to come from your workouts and your diet. There’s no way around that. Heck, even steroids don’t do anything for you if you don’t work hard in the gym. The next time you see one of those ads on TV or in a magazine, just remember, if it looks too good to be true, it probably is. Basics Pt. 5: Eat Well! About the only thing more potentially confusing than all of the training advice that you find in the hundreds of books and magazines (and blogs) out there is the incredible amount of nutritional advice out there. I am here to put your mind at ease. 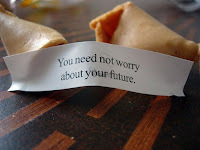 Listen to the fortune cookie! Here’s a secret: Unless you are a high-level athlete, most of what you need to know about nutrition you probably already know. What’s a better snack: an apple or a candy bar? What’s a better dinner: fried chicken or grilled chicken? You see! This stuff is easy! Really. This kind of thing is actually most of what we need to know. I’m not kidding. You fill in a few extra tidbits here and there and for most of us, that’s fine. People worry and worry about how much of this and how much of that they should eat, but how many people do you know got out of shape by eating too much salmon or broccoli? Of course if you cover the salmon in butter and the broccoli in cheese, that’s a different story. You see, here’s the thing: It’s actually pretty hard to eat too much good food. Why, you ask? A few reasons. For one thing, good food usually doesn’t have an overabundance of calories. Take lean meats, fruits or vegetables, for example. Four ounces of grilled chicken has only about 110 calories but it has about 25 grams of protein and only two or three grams of fat! For most people about four ounces of chicken is pretty filling and if it’s not, you can have more and still be doing very well on your calorie count. Also, lean meats have a lot of protein and foods high in protein have been shown to make you feel full. As far as fruits and veggies go, you can pretty much have all you want. A half cup of broccoli is only about 25 calories and an apple is only about 100 calories. The wonderful thing about fruits and vegetables is they are absolutely loaded with nutrients, and if you are worried about eating too much, they are also loaded with fiber. Fiber does a number of great things for your body and one of those things is that it makes you feel full. You can easily scarf down five or six hundred calories worth of frappucinos or candy bars in 15 minutes but can you really eat five or six apples in one shot? And that one apple you do eat has more nutrients than a million calories worth of Nutter Butters. The one small exception to this rule is starchy carbs. Without realizing it, you can definitely pack on a lot of calories worth of rice, for example. So, the key is to make sure you are eating enough good protein, fruits and veggies at the center of your meal to make you feel full. Another very important thing to keep in mind is that with all of the low-carb or low-fat or high-protein or Atkins or South Beach diets running around the most important thing for fat loss and general body composition is calories in/calories out. In other words, take in more calories than you burn and you gain weight. Burn more calories than you take in, and you will lose weight. It doesn’t matter if those calories are carbs or fat or whatever. Again. Simple. So, what is this telling us? If this is so simple, why do so many people have such a hard time? Why are people so confused? What can I do? 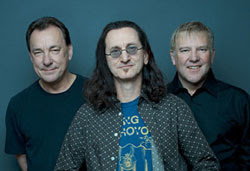 Why isn’t Rush in the Rock and Roll hall of fame? 1. Eat good nutrient dense foods. 2. Eat when you are hungry and until you are full. That’s it. Really, that’s about it. As we have talked about, it’s pretty hard to eat too much good food and if we eat until we are full we should be fine. If people aren’t fine then they must not be following these rules. That’s it for nutrition. When you get the hang of this, of course you can think about how much protein and carbs and fat to have, etc. But really, let’s all start with this and we’ll be much better off. 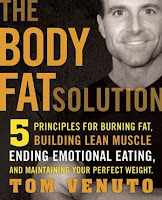 If you are interested in reading an outstanding book on this topic read The Body Fat Solution by Tom Venuto. There are hundreds of books about diets, but not too many about diet strategies and how to overcome the problems that so many of us face in trying to eat the right foods and control what he calls emotional eating. That’s not only the eating-when-depressed stereotype, but also eating out of habit and other reasons. It’s definitely helped me. Anyway, I hope this has helped. Of course, if you have any questions or comments feel free to email me at mitchrothbardttraining@yahoo.com or just leave a comment. I promise to answer you. Tomorrow I will talk about different kinds of supplements since that is another very confusing issue for people.